On October 22, 2007, His Holiness the Dalai Lama consecrated Drepung Loseling’s new property, beginning a dream of creating a “Little Tibet in Atlanta”. Many individuals are responsible for bringing the Center this far and for all of them we are sincerely grateful. But to complete our vision we need your help and support. 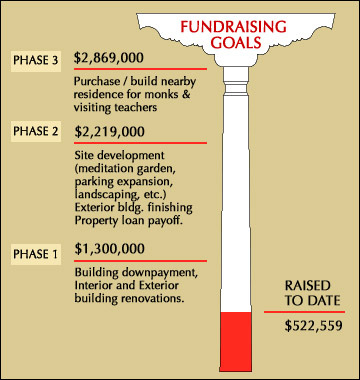 Our goal is to raise 2.87 million for the Center and a separate residence for the monks. Your sponsorship is vital to raising the funds for the purchase and renovation of our new Center and a home for our touring monks and teachers. With your contribution, Drepung Loseling can serve the community and continue its mission to preserve Tibet’s culture and spiritual legacy of wisdom and compassion for inner peace and global healing. Below is a list of sponsorship levels. Please click on the level to see the list of items that need sponsorship. The sponsorship name of your choice will be engraved on a plaque and placed under the space you have sponsored. You will also receive an acknowledgement in the Radiant Mind newsletter and be listed on the website. Parasol, Golden Fish, Treasure Vase, Lotus, Conch Shell and Endless Knot level sponsors will have name plates on a plaque under their sponsorship category and will be listed on the website and in the Radiant Mind newsletter for the year they contributed. Victory Sign level sponsors will be acknowledged on the website and in the Radiant Mind newsletter for the year they contributed and Dharma Wheel will be listed on the website. Obviously there are many more items that we need and we will continue to update this list with those items along with names of sponsors of existing items. We will keep an up-to-date version posted on Drepung Loseling’s website. Please note that names will not be repeated within a sponsorship level. If you wish your donation to remain anonymous, please let us know and we will mark the item accordingly.